MASSACHUSETTS, The Berkshires with Kids – Maybe it’s the lungfuls of fresh mountain air, dips in cool lakes, and miles of hiking trails. Or maybe it’s the outdoor symphonies, literary haunts, and impossibly charming New England towns. For all these reasons, the Berkshires have been attracting visitors (and repatriates) for centuries as a place to escape New York and Boston’s summer heat (the Berkshires are just a three-hour drive from New York to the South or Boston to the East). And when summer’s over? They come for the fall foliage that is the stuff of New England dreams. Can you just smell the apple cider? For families, the region offers cultural events, outdoor fun, and great places to eat. The following recommendations will hit all those things, plus the chance to stay at a real Gilded Age “cottage” and meet some local artisans. Take a hike! The Appalachian Trail awaits. Imagine coming home from your vacation and telling your friends/show-and-tell audience you hiked the Appalachian Trail. Talk about bragging rights! The Appalachian Trail meanders up the East Coast from Georgia to Maine and is the longest path in the world that is dedicated to hiking only. A portion goes right through the Berkshire Mountains and makes for a fantastic family hike. The trailhead in Great Barrington has good parking facilities and is a great place to hop on the trail for an easy hike with younger kids. Or you can head over to Mount Greylock, the highest peak in Massachusetts at almost 3,500 feet. The full hike from the base to the top of the mountain is a challenging eight miles. But its expansive views of New England will prove well worth it. If that’s too much for your brood, you can easily do just a small part of the climb—just stop in at the Visitor’s Station at mountain base and pick up a hiking map. Click for official site. Sit in with the Boston Symphony Orchestra during summer in the Berkshires. The Boston Symphony Orchestra has been relocating to the cooler climes of the Berkshires every summer since 1937. Their Tanglewood music season has become one of the most beloved music “festevents” in the country. In fact, it’s a bucket list item for virtually every classical music lover. 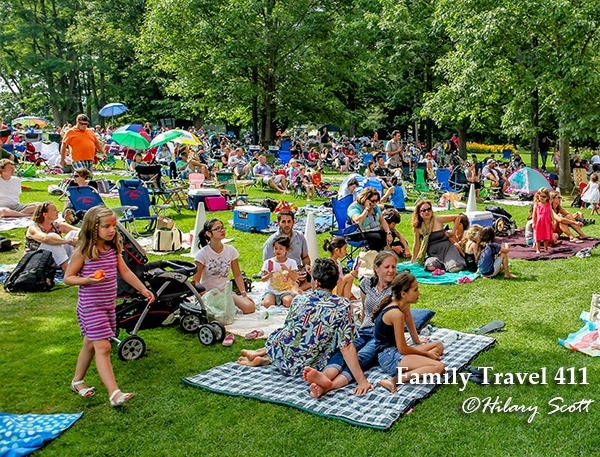 And since the concerts are held in a beautiful outdoor setting and bringing a picnic is de rigueur, you will find many children among the audience. To make it even more attractive to families, they offer 50% admission prices for children under 18 and have a host of family activities, including Watch and Play, a free interactive musical performance designed to engage children ages 3-10 in music appreciation. Click for official site. Artisans share their BIG appreciation of music and instruments at The Magic Fluke. Even if you don’t have a ukulele enthusiast in your family, you must visit the Magic Fluke during your stay in the Berkshires. The artisans in this small shop have been hand-making beautiful ukuleles since 1999. And they recently added a violin and an electric bass to their repertoire. Not only do they encourage customers (including children!) to try out the instruments, you will get a first-hand look at how they’re made. The workshop sits right behind the music shop and you will see artisans at work on their latest instrument. One of my greatest joys as a parent is watching my children engaged in a conversation with someone who is passionate about what they do. These guys not only have a passion for their work, but they are clearly eager to share their passion with even the youngest visitors. And really, is there a better souvenir than a Berkshire-made ukulele? Click for official site. SUP the day away with paddle board and kayak rentals at Adams. The Berkshires are dotted with ponds, lakes, and swimming holes. And what better place to burn off some energy and cool off at the same time? Lake Buel in Great Barrington stretches over a mile wide and is about 15 feet at its deepest. It has a small, easily accessible public beach where you can launch your watercraft. Also in Great Barrington is Lake Mansfield, which has a roped-off swimming area, a small playground, and a lovely walking loop that circles the lake. If you’re looking to rent a canoe, kayak, or stand-up paddle board (SUP), head over to Berkshire Outfitters in Adams. The rentals come with paddles and PDFs, everything you need for a great (and safe) day on the lake. Click for official site. Glimpse the Gilded Age at every turn when it’s YOUR turn to stay in an opulent “cottage” in the Berkshires. During the Gilded Age (late 19th century), it was very fashionable among a certain wealthy industrialists set to build a summer “cottage” in the Berkshires. And by cottage, they meant large and elaborate mansions. The Cranwell is an opulent Tudor cottage built by John Sloane in 1894. A visit gives you the chance to take a glimpse into the Gilded Age, while enjoying modern amenities. Among them: an indoor and outdoor pool, a golf course, and a fabulous spa. Many of their suites have separate living rooms with sofabeds and are a great option for families. Click for official site. Visiting the Berkshires with kids? Baba Louie’s offers family-friendly dining at the heart of Great Barrington. In the middle of downtown Great Barrington sits a great little pizza restaurant, Baba Louie’s. Although you can get a classic cheese pizza for your picky ones, their menu is full of fresh combinations that will make you want to return, and soon. We were particularly taken with the Puttanesca pizza, with shrimp, anchovies, capers, and green olives. They offer a gluten-free crust. Also, check for the daily pasta special, and a children’s pasta meal served with a side of broccoli. Click for official site. Hiking even a small piece of the Appalachian Trail seems like an amazing gift to give our children. We can’t wait to do a bit of the Appalchian Trail with our girls! Thanks for the other tips! Oh! What a cool place – I know our daughter would love that uke shop, and I’d love the restaurant! Thanks for the great tips. I love the idea of hiking a portion of the Appalachian Trail. It’s always been a travel dream of mine, and the kiddos always love to get outside. Oh, i want to go there just to jump in that lake (is it cold?!). I don’t know this part of the US at all but I’ve always heard how beautiful it is. Now I know how much there is to do with kids, too. Love the sound of ALL of it!